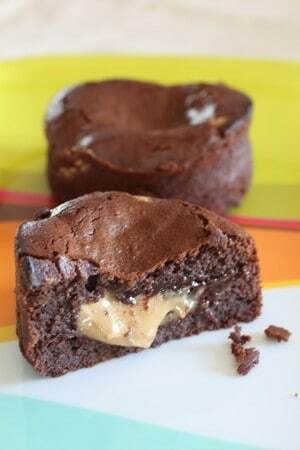 Chocolate Peanut Butter Cakes | Good. Food. Stories. I just spent the past hour looking at an incredibly thorough 56-picture slideshow of Reese Witherspoon’s sartorial history. Before that, I indulged myself by reading the New York Times Magazine and its riveting Ellen Barkin profile for a half hour, and before that I helped Garrett make a ridiculously creamy mac and cheese gratin. After leisurely clicking through the Reese Witherspoon slideshow, I researched potential citrus tree and blueberry bush candidates for the backyard. At no point this afternoon did I ever consider sitting down to write this post on single-serving chocolate peanut butter cakes—a recipe I made more than a month ago in lieu of fixing a busted sink stopper, (finally) taking the heaviest winter coats and boots to the attic armoire for their seasonal nap, and putting a looming writing deadline to bed. But chocolate and peanut butter are a more freakishly perfect match than Brad and Angelina, a more powerful combination than The Smith Family and a sweeter duo than Russell Brand and Katy Perry (what? I’m really rooting for those two crazy kids to make it work). And so the procrastination cakes belatedly take center stage. True to their name, you can get quite a lot of procrastination mileage out of these dense little cakes with gooey peanut butter centers. With the preparation requiring a few different bowls and batters, it’s easy to kill a half hour beating and baking the little devils, then another fifteen minutes cleaning up your mess—then another hour napping away the sugar coma induced by the intense treats. Yet the recipe requires so few ingredients and comes together so easily, there’s really no excuse not to toss these off in an afternoon and still finish all your projects by deadline. And just one cake will totally make you more creative and mellow—or fend off the wooziness of pesky low blood sugar, at the very least. Based on the molten chocolate cake brought richly to the public consciousness by Jean-Georges Vongerichten and updated with a tip by Food & Wine‘s Grace Parisi on sneaking that blob of peanut butter into the middle, the recipe’s frankly nothing less than an instant classic. And it’s much less expensive and time-inducing than replicating Reese Witherspoon’s entire wardrobe for your own closet. Preheat the oven to 450 degrees F and butter four 8-oz. ramekins or miniature cake pans. In a small saucepan, melt the butter over low heat, then stir in the chocolate until fully melted and smooth. Remove from heat and cool slightly. In a medium bowl, beat the sugar and eggs with a stand mixer fitted with the whisk attachment or an electric hand mixer until pale and frothy, about 2-3 minutes. Fold in the flour and then the melted chocolate. In a small bowl, beat the peanut butter and powdered sugar together until smooth and creamy. Spoon half the chocolate batter evenly into the prepared pans, then add 1/4 of the peanut butter to each dish. Top with the remaining half of the chocolate batter to fully cover the peanut butter. Bake for 10 minutes or until the tops are puffed and just slightly cracked. Cool on a rack for 5 minutes. The cakes can be served out of their pans by running a knife around the edges and inverting on a plate, or just spooned out of the dish and down your gullet.